The use of Artificial Intelligence (AI) is being coming out of the research labs to set out into our everyday lives. AI can now predict natural disasters to minimize the loss of lives that was previously out of reach. Among the many possible advantages of AI, predicting natural disasters is one such feasible option that has the potential to save huge loss of lives, and at the same time making rescue efforts easy and efficient. 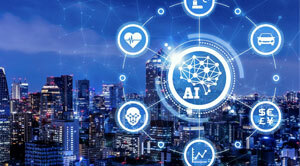 AI when combined with advanced data analytics gathers all the social media content related to that event into one place, scrutinize it, and offer the people with a better idea of the scene in the disaster area. Besides predicting natural disasters such as, floods, fires, earthquakes, and hurricanes, AI also helps in getting all the information about the structural integrity of all the buildings that are subjected to the disaster. Earth scientists use steel blocks to meticulously mimic the physical forces at work in case of earthquake, and also records and reports the seismic signals and sounds that are emitted. Employing machine learning algorithms, AI can recognize the deviations in the pattern of the signals emitted, long before an earthquake occurs. The distinctiveness of this sound pattern can be used to give an accurate estimate of the stress on the mishappening and to forecast when the earthquake will occur so that the precautionary measures and warnings can be given at the earliest. AI helps with the dispatch of emergency social workers to the right places that are affected by the disaster. The advancements in the technology will help to know the demographics, where it is the safest to land in order to clean and rebuild the place to the former state. The dataset collected turns to be even more useful when combined with imagery from drones and satellites.